Fear of Exposure: Do We Avoid Success Because We’re Afraid We Can’t Deliver? Whenever I find myself stuck at some point in my life, I tend to take a step back and try to figure out what is blocking my forward progress. In other words, I sift through what held me back in a similar fashion before. At this point, with a career move that is clearly not going as I’d envisioned, I’ve spent considerable time dredging through my mental file cabinets for answers. Answers because no matter how dire my circumstances became, I always found a way out of them. Perhaps the direction I found wasn’t optimal but it always got me moving forward again. What I’ve dredged up this time, however, is a deep and hoary mess. It seems I’m hindered by something from my childhood, a time when I first started believing I wasn’t good enough. Of course I didn’t come up with the idea all by myself. The truth is I consistently disappointed my mom. I didn’t have musical talent like my sister. I was socially awkward like so many introverts so her dream of having a popular child to live through was quashed. I was slightly overweight, though to hear her tell it, I was morbidly obese. Eventually I just stopped trying to please her. Though I was accepted by the two local universities I applied to, I just managed to get by and it wasn’t until years later that I finally earned my bachelors degree in a field far different from where I started. Fast forward to today. I’ve spent the last 4 years and most of my financial resources trying to create a new career path doing what I love, but I seem to just be shooting myself in the foot. Now, I feel I’m being forced to fall back on what I knew and fell into all those years ago. So what’s the underlying problem, you might ask? Despite over a million words I’ve written in the last few years both online and for my own writing projects, I haven’t been published anywhere that’s considered a reputable source. Not only to myself but to the world in general, I’m still a disappointment; a fraud. I haven’t stopped living down to the expectations I set when I gave up on ever making my mom proud. I know on a conscious level that it’s all crap; that I’m smart and talented and insightful. But that inner voice, despite my best efforts is stopping me in my tracks. Whenever I try to grow past my limitations it calls me out for the fraud it still needs me to be. The question is, how do I put that nasty, destructive, hypercritical, and above all, wrong voice to rest for good and actually start living up to my potential rather than down to my old, outdated expectations? I believe the most important part, albeit the hardest is to let my vulnerability show. I’m used to making it on my own, taking care of myself, and being strong. But I’m learning (through my writing, of course) that being strong is a concept I’ve misunderstood most of my life. It isn’t about doing everything yourself and holding the world at arm’s length. It’s not about wearing a facade that says everything is hunky dory when it isn’t anything of the sort. Being strong is a willingness to ask for help. It’s not being afraid to let people see that you can’t do it all by yourself. And it’s definitely not crawling deep into your cave, and pulling the door closed behind you when fear is crushing you and tears are too close to the surface for comfort. Strength lies instead in sharing your fears and accepting comfort. It’s in letting people help you find a way out of your latest abyss. Most of all, it’s being willing to admit that you are not an island in and of yourself and that not only can you give comfort and support, but you can receive it as well. This was one of my most difficult lessons. I always saw my dad as the strong one and my mom as the weak one. But as I’ve written my million or so words, I’ve had many epiphanies. The most surprising was the realization that the strong one in my parents’ relationship was actually the one who seemed the weakest. Mom may have worn a lot of masks, but she also knew how to ask for help from her friends, at least on certain levels. She did, on occasion let people see her vulnerable side. To my knowledge, Dad kept his well-hidden about 98% of the time. Admittedly, I’m still learning this lesson. Last night, my friend Kristal told me to be strong, and I said I didn’t feel strong at all. But she’s right. In letting her and other friends see me when I’m losing control instead of hiding until I can keep my false front in place, I’m exhibiting the strength I’m finally realizing. And where better to learn it than from a fellow dancer. We’re at our best when we put everything we have out on the floor. I guess this is true of most creatives; singers, writers, artists—we do our best work when we’re transparent and let all the crazy, messy emotions come out in our art. I feel right now like I have a long way to go to climb out of the hole which is mostly of my own creation and a lot more tears to shed in the process. But I am also embracing this new version of strength which is so much more fulfilling than the version I used to embrace. I am grateful for the lessons I’ve learned which taught me a much better definition of strength. I am grateful for the friends I’ve made since I broke the hard shell in which I’ve been encased and merely existing for decades. I am grateful for the tears which flow so easily right now. They are cleansing and cathartic, even if a bit embarrassing. I am grateful for abundance; friendship, words, inspiration, motivation, agitation, upheaval, strength, growth, success, freedom, well-paying clients, imagination, dreams, love, health, peace, harmony, philanthropy, and prosperity. I love the way the air smells just before the rain appears. I love the feel as the water cleanses the air. I love the sound as the drops hit the roof, first small drops, pitter pattering on the vent above my stove, then great big drops beating on my windows as the wind buffets them around. I love hearing the water as it pours out of the rain gutters and the whoosh as cars drive by and stir up the puddles. But today is different somehow. While I enjoyed listening to the rain during my meditation, hearing it wind and twist, intermingling with the sound of Scrappy’s purr, now that the rain has stopped and we’re left with no more than a heavy mist, I’m feeling unsettled, even jumpy and out of place. These feelings confuse me as I don’t know where they’re coming from. Could I just be catching someone else’s feelings? Their irritation, perhaps at some minor inconvenience or small delay? Am I tapping into someone else’s energy which causes my big toes and thumbs to ache for no apparent reason (aside from the toe I broke years ago and never let heal)? I don’t know the answers to the questions I’ve posed. The only thing I know for certain is that I do not like these feelings. They are preventing me from finding my usual child-like enjoyment in the phenomenon of water falling from the sky; the phenomenon we see seldom in this area; the phenomenon called rain. I relight the tea light in my Mediterranean sea salt holder and straighten the circle of heart stones which ring the candle. I pause, I ponder, I take a deep breath. I listen to the quiet hum of my computer, the only sound in the house, despite the fact that my daughter and her dog are sleeping in the guest room, my cats are scattered around the house and are, for a moment in time, all silent. It’s that feeling some call ‘the calm before the storm’ or ‘waiting for the other shoe to drop’. It’s knowing something is going to happen, but having no idea what that might be. It’s a sense of change which is about to occur, but the direction of that change is uncertain. Those who thrive on thoughts of chaos and destruction might be licking their chops, hoping for the largest most spectacular blast. But I am not one of those; one of the ones I call the ‘doom and gloomers’. I feel the changes as they ripple across my skin, but refuse to believe, in spite of even the most compelling evidence, that such changes are to be feared and prevented at all costs. Instead, I embrace those changes; welcome them; even invite them into my home. There has been a great deal of stagnation in my life time. People have moved from apathy to blame to entitlement, none of which improve their lives. The way I see it, change is kind of like weight lifting. In order to make changes, you have to surprise your muscles; do something different or unexpected. Use the muscles in a variety of ways so they don’t see what’s coming next and have to react to whatever you decide to do. Change is the same way. If those opposing it see you coming, they’ll throw up their defenses and you’ll never get through. You might as well beat your head against a wall. But if you, instead, show love and compassion, they’re not likely to guess that you’re instigating change via gentle persuasion. You’re showing them a different way so quietly and unassumingly that by the time things have changed, they’ve done so with complete buy in from all concerned. 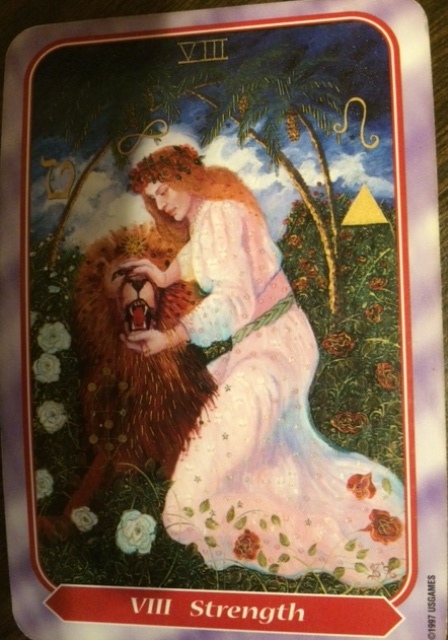 Such is the nature of the Strength card in Tarot. I find it interesting, now that the thought comes into my head that I took one of those Facebook quizzes today and it told me that my number was 8. 8 is the number of Strength in Tarot. And though I’ve reached this point in my typically convoluted manner, I believe it was because I was meant to find the connection. I needed to understand that this unsettled, atypical reaction to a lovely, rainy day is somehow telling me that quiet strength will be a factor in the weeks to come. It may be mine or it may be that I’m simply influenced by it and embracing the changes which are made possible by those who watch and wait, and love and give. The ones who know that lasting change is not brought about by wars and violence but by spinning a web of love and compassion and watching as it perpetuates itself. Watching how worlds change because people care about someone or something besides themselves. That caring doesn’t stop at the point where you can no longer see the results. It keeps moving outward in ever increasing circles, just as the ripples in a lake move outward when you toss a rock into the water. Compassion moves and flows through all situations. It is fluid and unfettered by rules and conventions. It simply is. It molds itself to whatever it encounters, then dissipates, moving on to something else, flowing, ever flowing, like the water in a lake. Certainly, it can take on the violent nature of waves crashing on the shore, but those waves only become violent through the addition of other elements. Compassion flows through and around those elements without changing its nature. The water which comes crashing to the shore, once the pressure is released, flows smoothly across the recently abused sand, soothing and smoothing. So too has my restlessness abated to some degree, knowing that a quiet strength is behind the unsettledness and that being unsettled under these circumstances just means that I’m already ready to be part of the change, and the anticipation is making me a little crazy. I can’t alter the pace of things to come, so no matter how much I want them to just be here already, I know that everything must happen in the proper time. The foundation has been laid, and the walls are being erected, stone by stone, heart by heart, each in its place to ensure the stability and endurability of the structure being built. And I feel very blessed to be a part of it. 1. I am grateful for my writing which allows me to work through any feelings or any concerns I might have. 2. I am grateful for change. It moves, it inspires and it brings people together to bring a better life to everyone. 3. I am grateful to those who choose to leave rather than change. They, too are doing their part to facilitate the changes needed. 4. I am grateful for a lovely, though short night of dancing. 5. I am grateful for nights when I just don’t feel that writing is what I need, yet I can somehow find something to write which does fill my needs. 6. I am grateful for abundance; love, compassion, friendship, joy, hearts, peace, harmony, health and prosperity.